With less than two weeks to go until UFC®’s sell-out debut event in Scotland, the organisation has confirmed the names of three fighters who will each travel to the Scottish capital as guest fighters for the event. 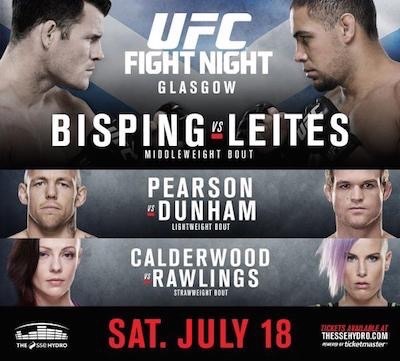 Women’s strawweight champion Joanna Jedrzejczyk, and top ten ranked featherweights Cub Swanson and Clay “The Carpenter” Guida, will all make the journey to Glasgow to meet fans and media alike, ahead of UFC FIGHT NIGHT®: BISPING vs. LEITES. The reigning 115lbs women’s champion, Jedrzejczyk successfully defended her title for the first time just last month, defeating the No. 3 ranked Jessica Penne in spectacular fashion in front of fans in Berlin, Germany. It was subsequently announced that Jedrzejczyk would be the latest fighter to form a partnership with leading apparel brand Reebok. Cub Swanson, meanwhile, remains the No.6 ranked fighter in the UFC’s featherweight division. Swanson holds wins over some of the biggest names in the 145lbs weight class, including Dennis Siver, Jeremy Stephens and Dustin “The Diamond” Poirier. Also making the journey to Glasgow will be veteran of the sport Clay Guida. Loved by fans for his colourful personality, Guida is arguably one of the most capable wrestlers within UFC. In April, Guida secured a win over Robbie Peralta at UFC FIGHT NIGHT®: MENDES vs. LAMAS and now holds more than 30 wins in his professional MMA career. All three fighters will be on hand to take part in a number of activities throughout UFC’s inaugural fight week in Glasgow. On Thursday, July 16th, the fighters will host an exclusive MMA masterclass for students from all over Scotland. Organised in partnership with Glasgow University, Sport and Recreation, students of all ages and ability levels will attend the seminar, which will include an introduction into a variety of techniques, as well as a Q&A and an autograph and photo session. The guest fighters will also pay a visit to Antonine Sports Centre, a local sports facility which UFC has supported for many years. There, members of the centre will have the unique opportunity to take part in a training seminar led by the fighters, as well as to have their photographs taken with their heroes. On Friday, July 17th fans traveling to Glasgow for UFC FIGHT NIGHT®: BISPING vs. LEITES will be invited to take part in a live Q&A with Jedrzejczyk, Swanson and Guida, just before the public weigh-ins begin. The Q&A will take place at the SSE Hydro from 12:45-13:30. Doors open to UFC FIGHT CLUB™ members at 12:00 and to the general public at 12:15. Following the live UFC FIGHT NIGHT®: BISPING vs. LEITES weigh-ins, the guest fighters will also take part in a fan signing, which takes place between 14:30-16:00. UFC® FIGHT NIGHT: BISPING vs. LEITES will take place on Saturday, July 18th at the SSE Hydro in Glasgow. Headlined by a five round bout between the UK’s Michael Bisping and Brazilian Thales Leites, the fight card also features three Scottish fighters – Robert Whiteford, Stevie Ray and Joanne Calderwood. Tickets to the event sold out in a matter of hours after going on general sale, so fans can expect a packed out arena on the night. UFC FIGHT NIGHT®: BISPING vs. LEITES will be aired live from 3:00 p.m. in the UK and Ireland on the BT Sport app. For the latest information on this event, please visit www.ufc.com or follow @UFC_UK on twitter.